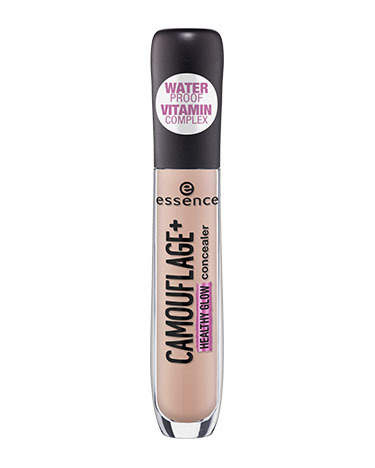 camouflage + healthy glow concealer has a rating of 5.0 stars based on 1 reviews. The liquid concealer texture with light-reflecting pigments, vitamin E and provitamin B5 provides the area around the eyes with a wide-awake, healthy look and a natural glow. The concealer is waterproof, so it’s super long-lasting. 10| INGREDIENTS: AQUA (WATER), CYCLOPENTASILOXANE, CYCLOHEXASILOXANE, GLYCERIN, CETYL PEG/PPG-10/1 DIMETHICONE, POLYMETHYLSILSESQUIOXANE, POLYGLYCERYL-4 ISOSTEARATE, PANTHENOL, TOCOPHERYL ACETATE, SODIUM CHLORIDE, MICA, PROPYLENE GLYCOL, CERA ALBA (BEESWAX), STEAROYL INULIN, DIMETHICONE CROSSPOLYMER, DIMETHICONOL, TRIMETHOXYCAPRYLYLSILANE, ETHYLHEXYLGLYCERIN, TRIETHOXYCAPRYLYLSILANE, TIN OXIDE, BENZYL SALICYLATE, PHENOXYETHANOL, PARFUM (FRAGRANCE), ALPHA-ISOMETHYL IONONE, HEXYL CINNAMAL, CI 77491, CI 77492, CI 77499 (IRON OXIDES), CI 77891 (TITANIUM DIOXIDE). 20| INGREDIENTS: AQUA (WATER), CYCLOPENTASILOXANE, CYCLOHEXASILOXANE, GLYCERIN, CETYL PEG/PPG-10/1 DIMETHICONE, POLYMETHYLSILSESQUIOXANE, POLYGLYCERYL-4 ISOSTEARATE, PANTHENOL, TOCOPHERYL ACETATE, SODIUM CHLORIDE, MICA, PROPYLENE GLYCOL, CERA ALBA (BEESWAX), STEAROYL INULIN, DIMETHICONE CROSSPOLYMER, DIMETHICONOL, TRIMETHOXYCAPRYLYLSILANE, ETHYLHEXYLGLYCERIN, TRIETHOXYCAPRYLYLSILANE, TIN OXIDE, BENZYL SALICYLATE, PHENOXYETHANOL, PARFUM (FRAGRANCE), ALPHA-ISOMETHYL IONONE, HEXYL CINNAMAL, CI 77491, CI 77492, CI 77499 (IRON OXIDES), CI 77891 (TITANIUM DIOXIDE).